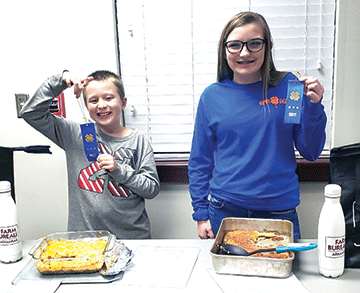 Evan Wolcott, left, and Kinlee Stivers display their first place ribbons they won in the Dairy Foods Contest held last month by the Sevier County Extension Service. Arkansas Farm Bureau sponsors the annual contest. The Sevier County Extension Office held the annual Dairy Foods Contest last month which is sponsored by Arkansas Farm Bureau. The two categories available in which to compete were main dish and party dish. Youth presented their previously prepared dish, along with the recipe. They were judged on presentation, taste, difficulty, and the diary ingredient they used. The winner in the main dish category was Evan Wolcott. Wolcott prepared a Keto Shephard’s Pie that he prepares at home for his family. Wolcott said he chose this dish because he loves the cheddar cheese and cream cheese that he uses to make it. The winner in the party dish category was Kinlee Stivers. Stivers prepared a Sophia Cheesecake from a recipe that she received from a friend. Stivers stated that she simply loves food and would serve the cheesecake with ice cream and cherries. The top winner from each category had their recipe submitted to the Arkansas Dairy Foods Contest to be held in Little Rock. This annual event is sponsored during June Dairy Month by Arkansas Farm Bureau and the Arkansas Dairy Cooperative Association. Our local Sevier County Extension Homemakers Club (EHC) members, Catherine Smith, Iris Saylor, Judy Vann-Hamilton, and Terrie Jacobs, judged the contest.